Thyroid gland is part of endocrine system that lies in the human neck and its function is to secrete thyroid hormone used to control the metabolism inside the human body. The 131 Iodine (131I) uptake procedure is kind of quantitative analysis techniques used in the diagnosis of thyroid problems, mainly related with cases of hyperthyroidism and thyroid cancer. This procedure required a patient to ingest 131I in liquid or capsule form at very low quantities. This procedure was not painful and very low radiation emit from the 131I throughout the body. After 131I administered inside the body will go to the thyroid gland which consume iodine. The 131I uptake percentage of this patient will be examined by using a scintillation radiation detector called “Thyroid Uptake Counter” after two, six or 24 hours and sometimes thirty hours after a period time. This exam is very important and simple method to determine the iodine uptake from the patient besides using other techniques such as gamma camera. Normal 131I uptake is between 15 to 25 percent, but will change if the patient consuming food ingredients that have high levels of iodine such as seafood and dairy products. Taking drugs for other ailments. Underwent x-ray tests using iodine-based contrast within the near future. You are asked to swallow liquid or capsule containing radioactive 131I. After that patients can carry out routine activities. After a certain time period (usually 6 and 24 hours later), the patient shall return to the hospital so that the amount of radioactivity in the thyroid gland can be measured. 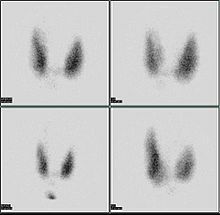 This is done by using “Thyroid Uptake Counter” as shown at Figure 2. 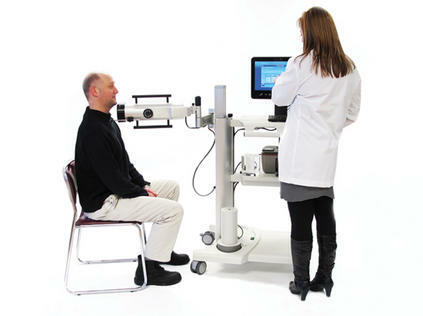 While this test is performed, patients are asked to sit in seats available. For one to two minutes, “probe” on the device is placed on the front of the patient’s neck, thyroid gland which is located. Then the “probe” will be placed on hips patients within one to two minutes to get a more accurate measurement. And the process of determining the rate 131I takes about less than 10 minutes. With the total quantity of radioactivity is very small, and there are no recorded side effects so far, the amount of iodine used in these procedure is less than the normal amount of iodine in the diet. Patients with allergies to iodine in the diet may not be able to have this test. Pregnant women and breast-feeding is not recommended to undergo this test due to the radiation effects of the foetus or babies. 131I will leaves your body through urine. You may need to take precautions, such as flushing twice after urinating, for 24-48 hours after the test. Patients may consult the officer conducting these tests for further additional advice. Society of Nuclear Medicine Procedure Guideline for Thyroid Uptake Measurement, 2006.